Wow, I've missed your faces! Earlier this week, me and my friend Sam finally had non-clashing schedules so went out in the sunshine for a catch-up and few cold frosty ones. I'm still rather obsessed with clashing prints, so prepare yourself for yet another outfit which is teetering (and probably wobbling over the edge and hanging on for dear life...) on the verge of poor poor taste. I blame my recent craving for bright bold colours and a mish-mash of textures and patterns on the fact for work I'm in a black shirt, black black cardigan, black skinny jeans and black Converse. So I'm going OTT at any chance I can get. POINT OF FASHION: Hello, my name is Betty Suarez. 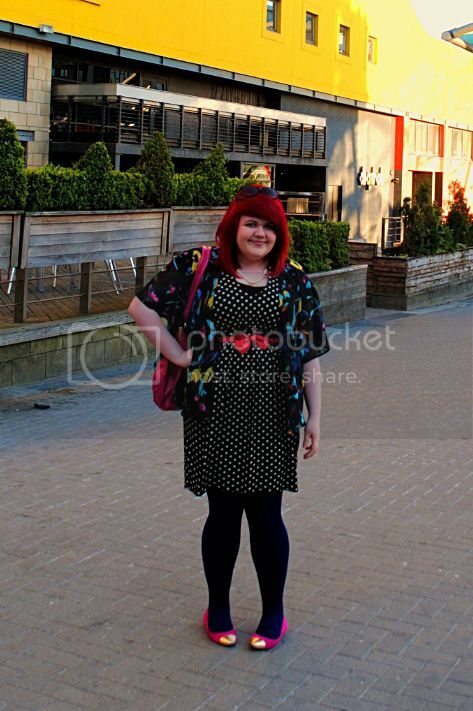 Also check me out with an 'on location' photo, like A PROPER FASHUN BLOGGER! 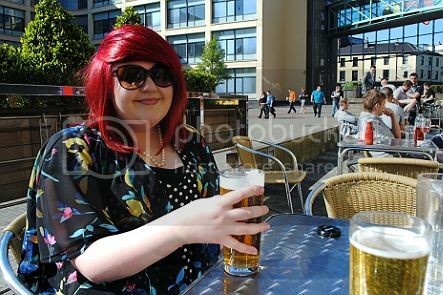 I'm in Times Square in Newcastle, which is the heart of the gay scene in town, and the best place to go for an ice cold beer on a hot day. 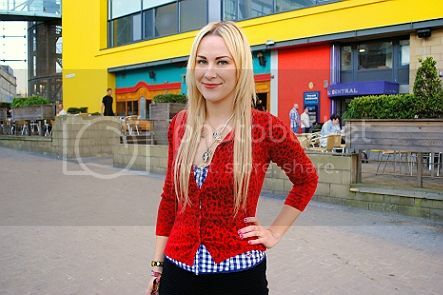 The deck you can see behind me is attached to a bar called Twist, one of my favourites! If you'd like to read some more, Daniel wrote a peice last month for SoSoGay.org about the Newcastle scene. 1: If you follow my 365 Day Tumblr you may have seen this already - but yeah, I'm currently spending a lot of my time at Mode Magazine with Betty! It's such an inspirational show. 2: Nommm, the deck at Twist is the best! There's always such a mix of characters, and a pretty even gay/straight divide. On that day, it was full of boyish wrestling fans heading for an event at the arena! 3: Sam is so beautiful, she hurts my eyes sometimes. She recently got hair extentions and kept swishing them about in the sun! Speaking of Sam, I mentioned that she was recently awarded a Royal Television Award for her short film Not Enough Time, which is based on a true event in her life. The film is now in for the National prize, which is so exciting! This week, local news North East Tonight even did a peice on on her and the film. Believe me, the word 'PROUD' does not even come close. It's still on the website, so please give it a watch and support an amazing local film. Finally, the Modalu Giveaway closed this week, and I'll be announcing the winner within the next few days. I haven't had a spare moment to count the entries properly - so I promise to let you all know soon, now I actually have some time on my hands! I was in Twist last night, doing shots of tequila. Probably explains why I feel so rotten today! Love that little shug you've got on, Primark have been cracking out some good stuff lately like. I don't think this outfit clashes at all, I actually love it!!! Think you're looking lovely, nothing borderline about this outfit. Glad you got to enjoy the warm weather too, sounds like you have the ideal spots sorted! I love the pattern clashing, my theory is to always put on one thing that clashes, to make an outfit interesting, otherwise things are too matchy match! 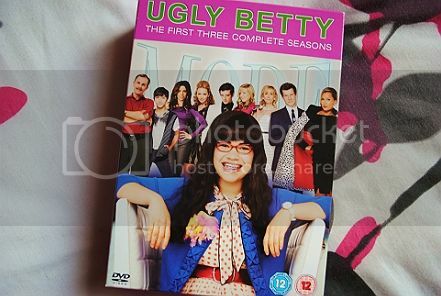 I just started watching Ugly Better on streaming. Love it! It is inspiring, you are so right. I'm just half way through the first season.